The 12.9" iPad Pro goes official! You are here: GeekSays Technology News » Apple » iPad News » The 12.9″ iPad Pro goes official! 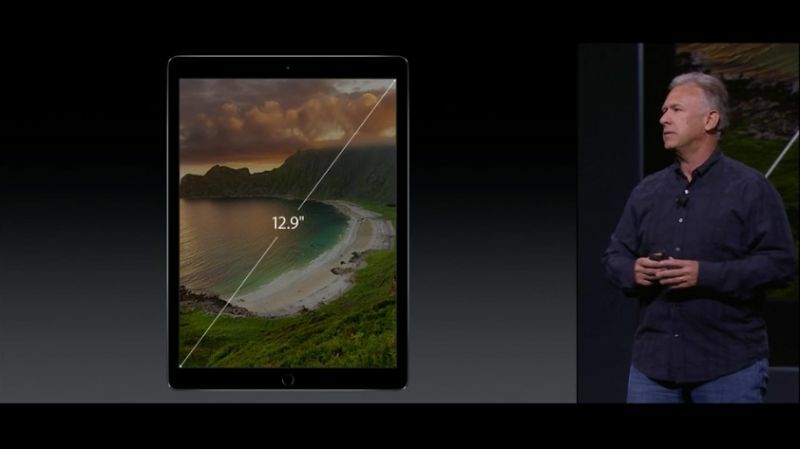 The 12.9″ iPad Pro goes official! One of the most expected tech events of this fall is now consumed. Apple introduced their new smartphones, iPhone 6S and 6S Plus, but like we were saying a few days ago, these weren’t the only things the Cupertino-based manufacturer had for us. Two new tablets, iPad mini 4 and iPad Pro were also presented, the latter being way more interesting than the mini. It finally happened. And it looks good! We were looking forward to seeing this new tablet, as a lot of rumors were pointing to a ‘bigger iPad’. It’s indeed big, but very stylish, measuring just 6.9 mm in thickness and weighing 712 grams, alongside relatively slim bezels. With a 12.9″ display and a resolution of 2732 x 2048, the pixel density is the same as on the iPad Air 2, 264 ppi, so don’t expect some extreme sharpness. Still, it’s a Retina display and it looks very good. Under the hood, the iPad Pro sports the brand new A9x chip, while details about the amount of RAM are not avalable. Still, Apple claims that the tablet is faster than 90% of all portable PCs shipped within the last year. Now this is something we’d love to test! Other features worth mentioning are the 8 MP iSight camera, Touch ID and a four-speaker audio setup. Finally, the battery should last for about 10 hours of intensive use. And by intensive we mean non stop! The iPad Pro has a stylus! But the most interesting thing brought by the iPad Pro is the Apple Pencil, developed with Microsoft, in order to enjoy the best MS Office experience. The tablet runs the latest version of Apple’s operating system, iOS 9 and it will be available in Silver, Space Gray and Gold, starting with November. The starting price is $799, for the 32 GB Wi-Fi model, $949 for 128 GB with Wi-Fi and $1079 for the 128 GB model, with a SIM support. Any first impressions about the iPad Pro? Would you buy it?